The bachelorette party has been elevated from phallic to phenomenal. Instead of a night bar-hopping it’s a weekend trip adventure seeking. The bride’s vibe and tribe can determine what sort of bachelorette party you go for; spa or stilettos, goat yoga or Chippendales…there are endless options. One epic option is Palm Springs, California. I went there on a Bachelorette party for my friend Tina. She’s a creative and always up for anything. We threw around ideas of places to go and then started looking at the houses available in Palm Spring on AirBnB and it was done. Palm Springs or bust! The majority of us flew from Dallas to Orange County and rented a mini-van for the two-hour drive because…mini-vans are just more fun! As soon as everyone was there it was time to party! Unfortunately, the house sold and no longer available to rent, but there are a lot more to choose from in the area. We really loved the open concept living room and kitchen. Plus, the house came with floaties! Party favors are a must! Matching sunglasses and bracelets make for fun photos and party unity. Breakfast of bachelorette champions: pizza rolls and mimosas! 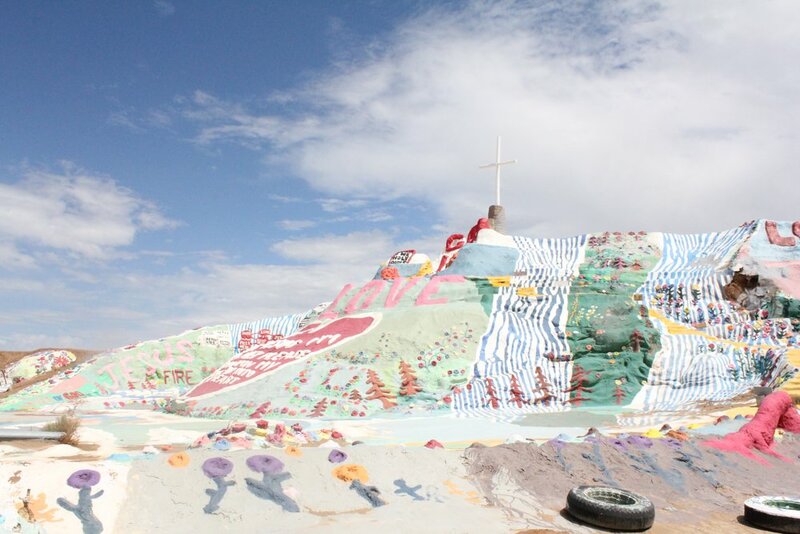 I did some research in the area and found out Salvation Mountain was about an hour and a half away. We loaded up and were on our way. The drive isn’t bad and pretty scenic. We arrived after a desert rain storm so we weren’t able to climb on the mountain, but it was still very cool and obviously Instagram-worthy. There is really nothing out there. A small neighborhood with some questionable characters. And more random photo opportunities. On the way back to Palm Springs we made a pit stop at the Salton Sea. This place is so unique, extraordinary and creepy. Once a thriving social spot is now a dried up, dead-fish smelling area of sadness. It’s like a bomb went off. Read up on it before you go, it’s a pretty fascinating story. Dinner was at a really cool spot called Workshop Kitchen + Bar. Brunch at the colorful Saguaro hotel. 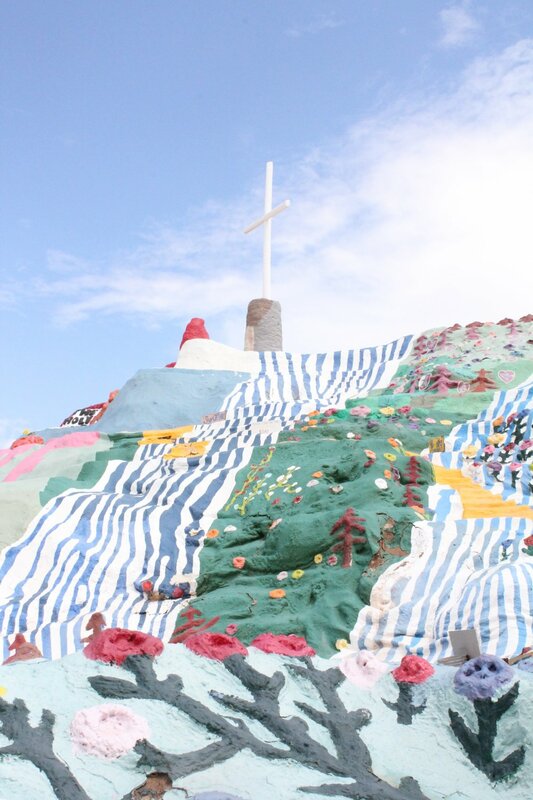 This place is like a real-life candy land. Tip: wear your swimsuits and stay for drinks and pool-side lounging after brunch. Palm Springs = The Parker. This hotel is iconic. It's old Hollywood glam meets retro funk. We made a late night stop for drinks, I mean drink because those things are pricey! I wish we had made it there during the day, but to walk around the grounds at night discovering unique decor and hideaway pools. We continued our color tour with a visit to the Palm Spring Art Museum. I had read about a light installation and it did not disappoint. The full museum is really wonderful and a must-do. It’s not too big, yet full of great pieces. There's no better way to end a weekend than with ice cream! We made a delicious stop at the Ice Cream and Shop and cooled down with handmade flavors like Lavender and Coachella crunch.